Pursuing one of my favourite pastimes with Baby. Since Baby arrived my priorities, aside from taking care of her, have been getting exercise and fresh air and eating right. 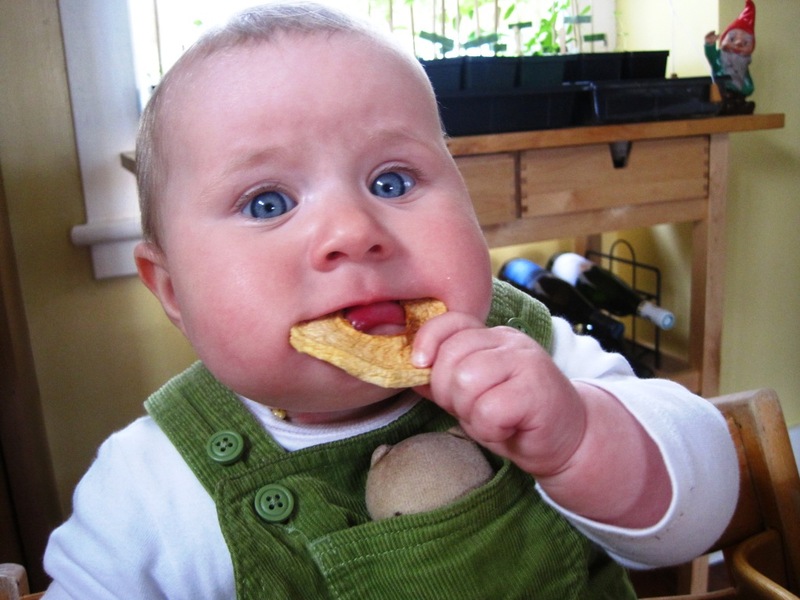 Just like Baby, I get grumpy and tired if I don’t eat regularly and properly. Also, it’s no secret that I love to eat and cooking is one of my favourite activities. 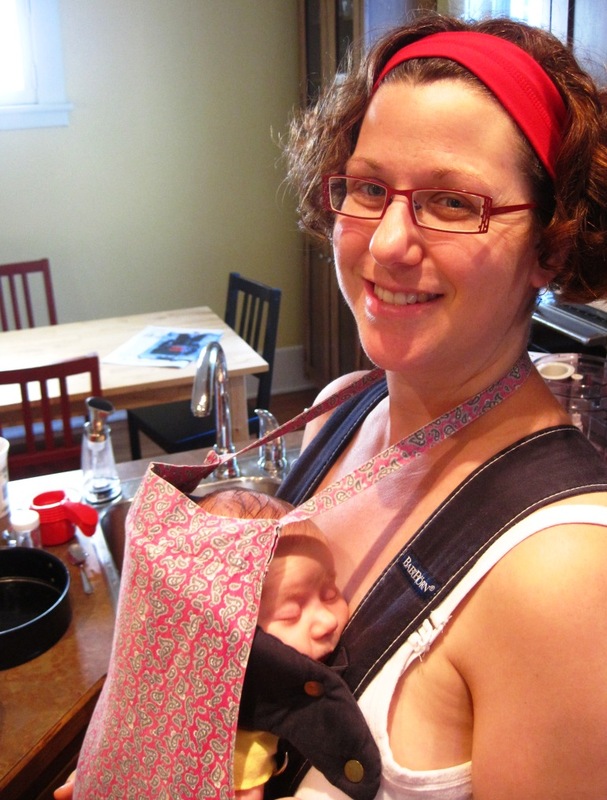 No surprise then that before having Baby, I was already thinking about how to nourish myself once she arrived, knowing that I’d be regularly occupied with her and, for a while at least, less mobile. The arrangement we came up with worked well and we’ve continued to prepare and enjoy satisfying meals! For the first three weeks after her birth, the deal was that David, who was off from work, was responsible for food and making sure I ate properly. He did the cooking and didn’t even use any of the meals we’d prepared in advance. Then my mom visited for two weeks and took over the kitchen. She spoiled us with her excellent cooking and baking. She actually added to our freezer stores. Last week, we started our new routine of weekly menus. It starts with a meal plan – a tried and tested tool! – using what we have on hand. We cook at least one weekday meal on Sunday, making sure there’s enough for at least two lunches (a hearty soup is easiest). Then we dip into our freezer stores for one meal per week and gratefully accept grandmaman’s offer to cook dinner on Thursdays. The days we cook fresh, the meal is prepared bit-by-bit whenever I have a moment throughout the day. By the time David gets home from work, it’s ready to cook. Often I’ll do the cooking myself, because it gives me a break from Baby – as much as I love her, I welcome a break by that time of day! – and the satisfaction of doing something I enjoy. We’re not cooking superheros though, and have also resorted to take-out several times in the last seven weeks. 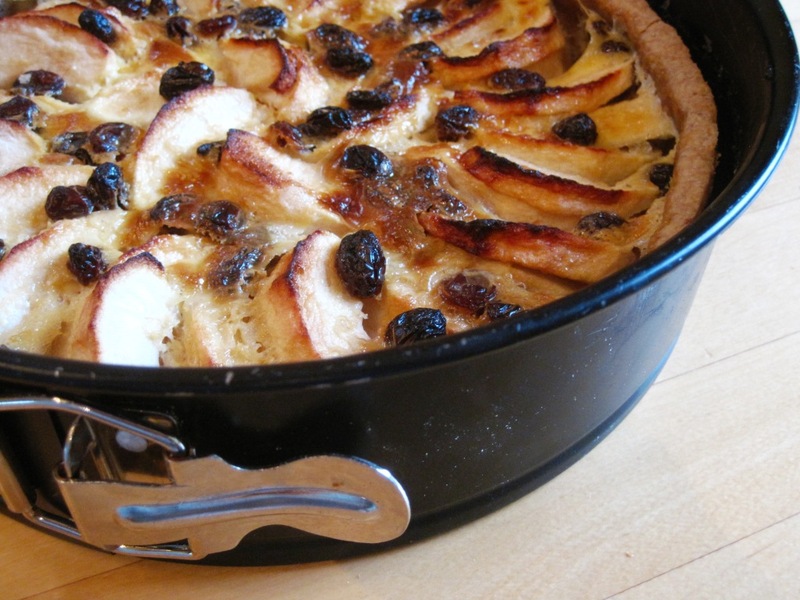 Last night this tart, a fall favourite, followed a meal of homemade soup. Making it was a three-day affair: I made the dough and lined the cake pan the first day, blind baked it the second, and finished the tart on the third. That’s not unusual these days – whatever it takes to get it done! Heat oven to 375°F. Grease a 9″ cake pan. Prepare the pastry dough. Roll it out to 1/4″ thick and line the cake pan. Weigh it down and blind bake it for 10-15 minutes. Remove weights and continue baking for another 10 minutes until lightly coloured. Remove from oven. Reduce oven temperature to 350°F. 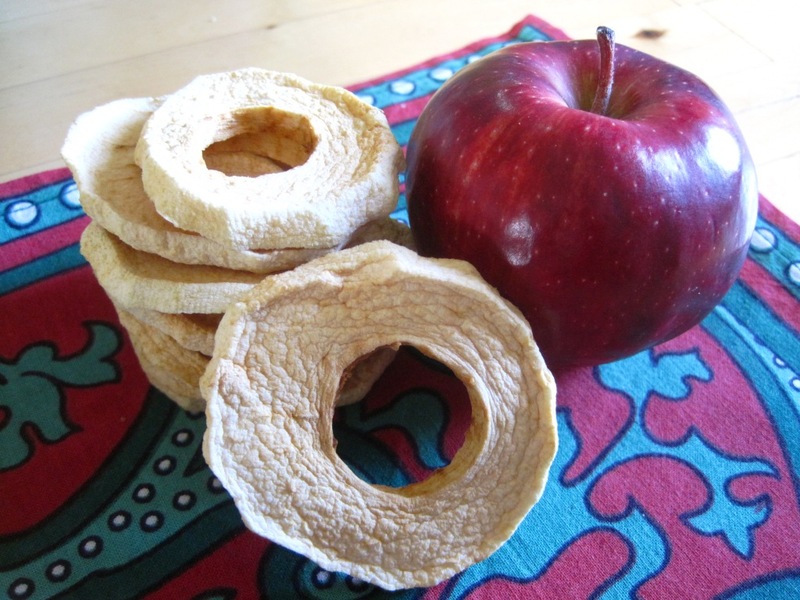 In a bowl, toss apple slices with lemon juice and two tablespoons of the sugar. Set aside. In a separate bowl, combine cream, egg (yolks), vanilla, raisins, the remaining 2 tablespoons of sugar, and salt. Arrange apple slices on tart shell. Pour cream mixture over apples. Bake for 50-60 minutes or until apples are done. Allow to cool slightly before removing from cake pan. 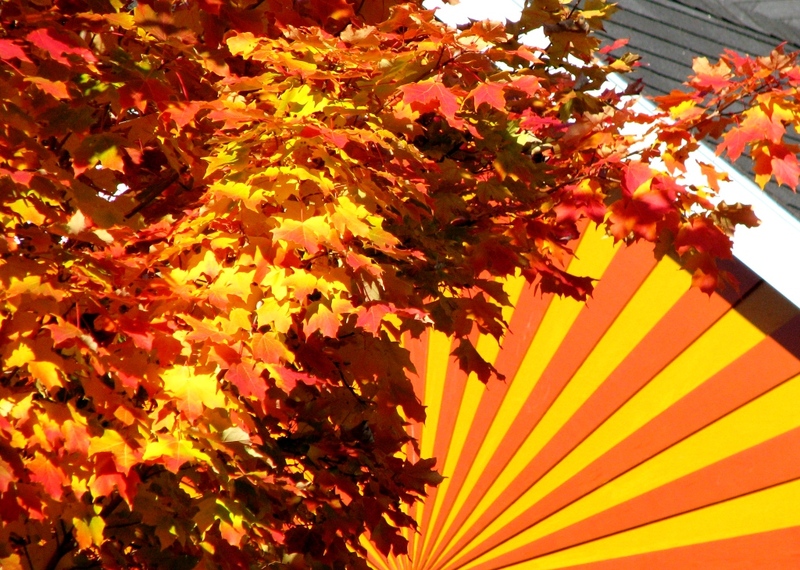 Although the exuberance of fall with its bright colours and crunchy leaves has already passed, the colourful fall harvest is still readily available. 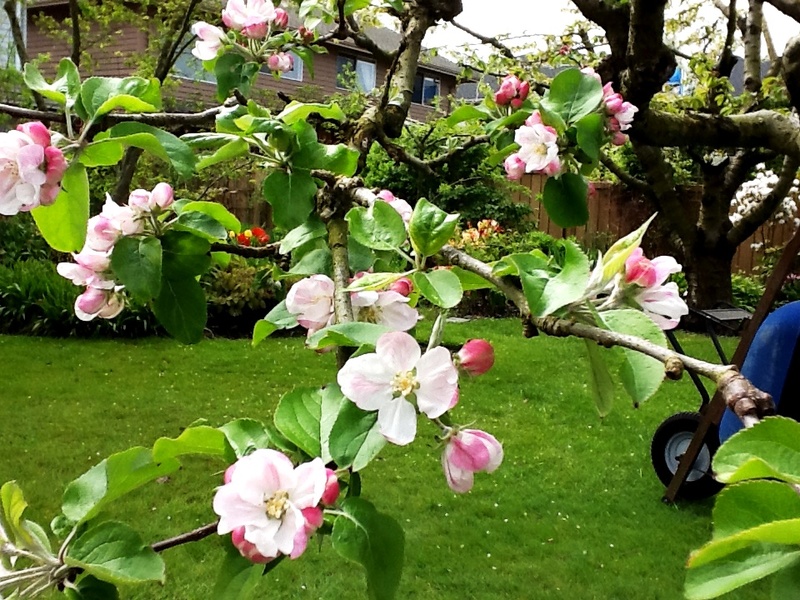 I like this time of year. The flavours become somewhat “heavier,” more concentrated, yet they’re still fresh and crisp. 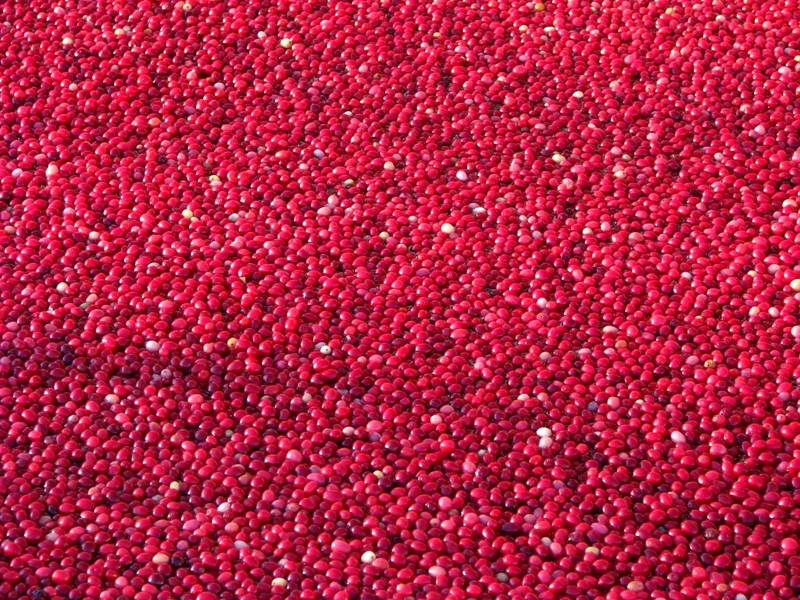 Apples and cranberries are among the iconic fall produce. 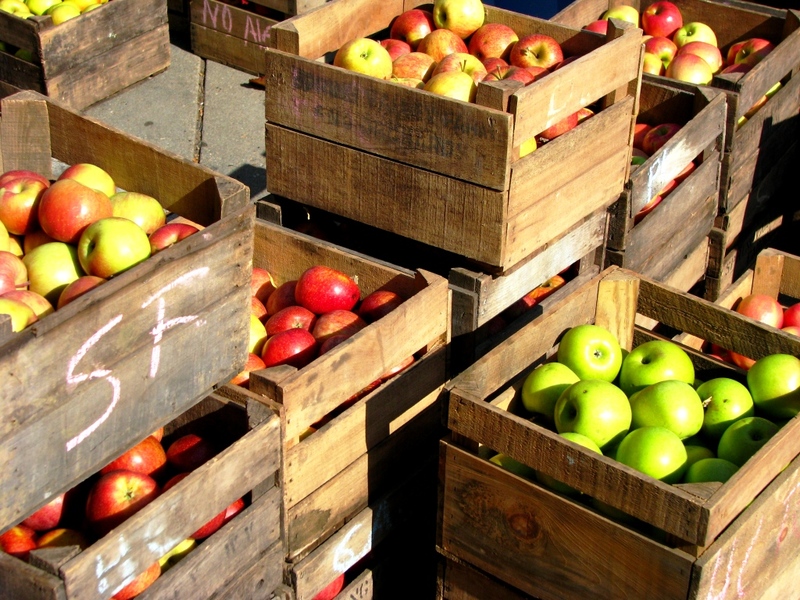 Apple crates at Dupont Circle market in Washington D.C..
Apples and cranberries are also a classic seasonal combination. 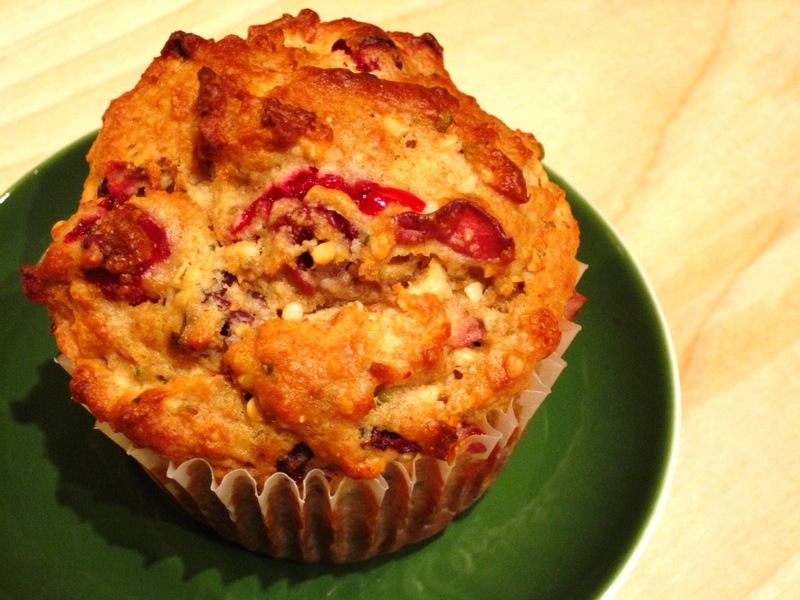 Here they are in a muffin, which combines fresh and dried cranberries, and also incorporates healthy hemp hearts. Hemp hearts have a delicate nutty flavour and are a good source of Omega 3 and 6 essential fats. Health food stores are most likely to stock hemp hearts; a popular brand is Manitoba Harvest. In a bowl, combine all wet ingredients. Combine all dry ingredients in a second bowl. Pour wet ingredients into dry, and blend until flour mixture is just moistened. Fill muffin cups. Bake 20-25 minutes or until golden brown and tester comes out clean. 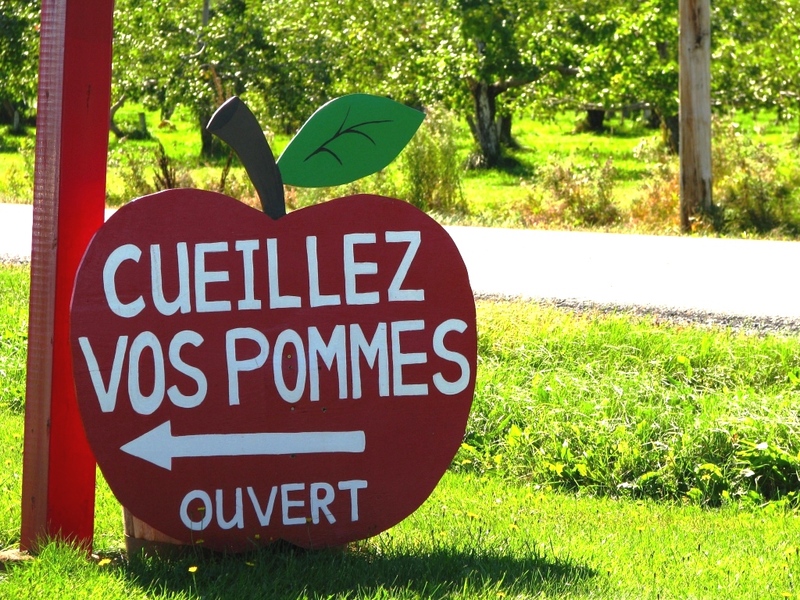 U-pick apples in Rougemont, Québec. 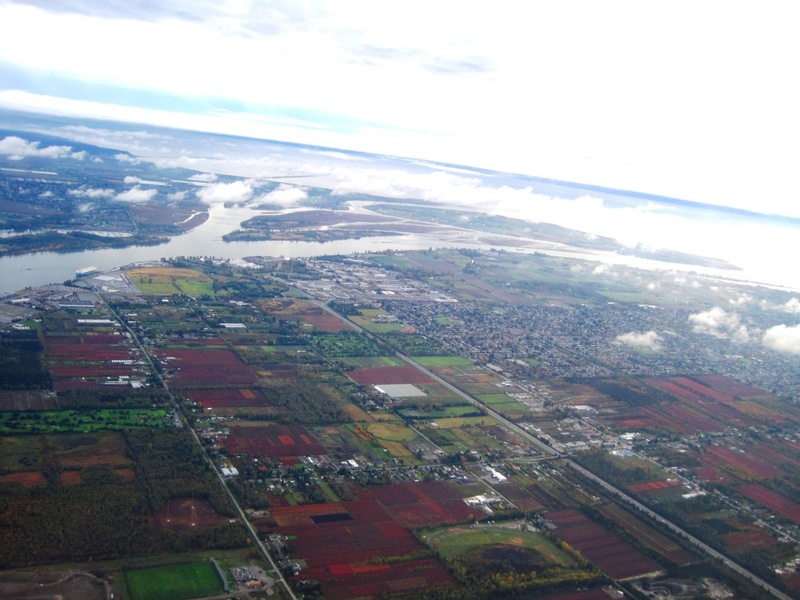 Bird’s eye view of cranberry bogs in Richmond, B.C..
Fall colours in my neighbourhood.